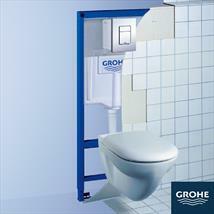 GROHE is a world leader in providing sanitary fittings and is dedicated to providing innovating water products. 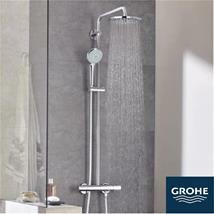 For decades, GROHE has been at the forefront of quality, technology, sustainability and design. Whether you are looking to give your bathroom a makeover, have a new shower or just installing a tap in the kitchen that offers sparkling water. 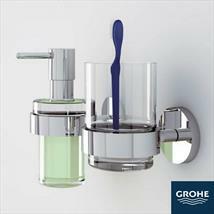 Here at Plumbing for Less we have a great range of bathroom products in a wide variety of styles, some of our new and exciting developments include GROHE's pioneering Power&Soul® shower with seven ‘one click’ combinations of invigorating and relaxing spray patterns, we also offer GROHE Eurocube, which offers a Cosmopolitan range at an affordable prices. 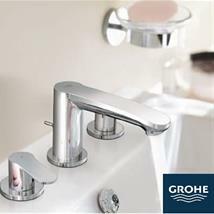 For kitchens, we have professional, innovative products such as Minta Touch, which offers hands-free control, and GROHE Blue®, offering filtered, chilled, still or sparkling water straight out of the tap – saving money in a sustainable way. 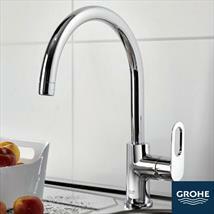 GROHE Red™, on the other hand, delivers boiling hot water easily.